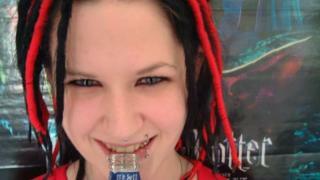 Sophie Lancaster was just 20 when she was kicked to death by teenage boys - all because she was a goth. Ten years on, have attitudes changed or are young people scared to be different? On the evening of 11 August 2007 Sophie and her boyfriend Robert Maltby were walking through Stubbylee Park in Bacup, Lancashire, when they were both attacked and left for dead. Robert woke from his coma a week later but Sophie never did. With dreadlocked hair, dark clothing and piercings, the pair were "singled out, not for anything they said or did, but because of their dress", the chief crown prosecutor for Lancashire said at the time. The outcome of the attack shocked the public, but for those like Sophie and Robert, there was a feeling of inevitability. "I've been called freak, gay and transvestite, among other things, by random people in the street," says Nathan Slack. Now 36 and living in London, he remembers the experience of growing up a goth in March, Cambridgeshire, around the time Sophie was killed. "I had objects hurled at me from cars, my own car was vandalised after I was threatened with physical violence and I was spat at in the street," he says. For Robert Shread, the abuse he received for how he dressed was even more brutal. When he was 18, he was attacked as he left an alternative nightclub in Portsmouth, where people who judged others for their lifestyle were waiting nearby. "I was jumped by a couple of trendy guys who apparently wanted to know what time it was," he says. "The guys knocked me down and started kicking me in the head until I passed out." Robert woke up two days later unable to recall the events of the night. Because of the beating, he lost a year and a half of his memory, including any recollection of his girlfriend. "It completely changed me," he said. "I used to be a lot more outgoing. It's the root of the generalised anxiety disorder that I'm having to deal with today. "Going outside is terrifying and that in itself is frustrating. I still expect strangers to attack me for no reason." Matthew Sly, 34, remembers similar experiences when growing up in Tadley, Hampshire. "I know I was lucky I was only attacked once," he says. "I've always been about 6ft 1in and when people want to attack those for how they look, they tend to want to know what the outcome will be. "I would still get shouts in the street though and it happened to a lot of people I knew. You just had to be prepared for it and we got used to it." When talking to young people growing up today who dress in goth and alternative clothing, it seems there is still a battle to fight. The parents of 16-year-old Hannah Foxton took her out of school because of how bad her experiences were. "I was really into the Mighty Boosh TV show and had a bag from it, which was quite alternative," she says. "A couple of girls started calling me names and shouting at me. "It then got worse and they tried to push me out into the highway. I just broke down in tears." Hannah said she tried to change her look to "fit in" but it led to a loss of confidence. "I just wouldn't leave the flat for months... Any time I went outside, I had panic attacks. It was brutal." It was only when she moved to Nottingham that she felt she could finally be who she wanted to be. "I needed to be happy and get that confidence back," she says. "Yes, I still get the odd stare and shout of 'Satan' but I also get compliments." Despite coming from a large city with a strong musical past, Luke Daley, 19, has been subjected to violence in Liverpool. "School was always full of people shouting stuff, telling me to 'stop cutting myself', but that I could deal with," he says. "It's outside of school, when you just don't know if someone will look at you and start something." Luke was attacked at a shopping centre, but after being punched in the stomach, he and his girlfriend got away. Another of his friends was not so lucky. "I know a lad who dresses a bit goth and a bit glam who ended up in critical care," he says. "He had his head split open with a crowbar after being attacked by five other lads because of what he was wearing. "What happened to Sophie isn't alien to me. It is only 20 or 30 miles down the road. I am kind of used to it but only because if I let it affect me, I could never leave the house. I am not locking myself away though." Sophie's mum Sylvia knows what the community has gone through. Her daughter had been attacked three times before and she had witnessed her being abused. "When I was out on the streets with Sophie, I would hear people's comments," she says. "I would hear them say 'look at the state of that' or 'what does she look like'. "I remember going into one shop and the look they gave her. After they had spoken to her for five minutes, that went as they realised she was actually quite a lovely little thing, but it was funny to see that. "I would always think, how dare you judge somebody on the way they look?" In her daughter's memory, Sylvia has set up a charity - The Sophie Lancaster Foundation - to help prevent the prejudices and experiences many goths go through. Using her experience as a youth worker she goes into schools to talk to people about their judgements and to try to show them the consequences. "Young people are not stupid and sometimes we demonise them. Actually what we need to do is talk to them properly." Sylvia's campaign has seen her receive support from around the world and appointed an OBE. Her efforts have also had a real effect. Attacking someone for being part of an alternative subculture is now recognised as a hate crime. Greater Manchester Police was the first force in the UK to treat such offences in that way, raising awareness that attacks would not be tolerated and could lead to longer sentences. Since bringing in the policy in 2013, almost 100 incidents - ranging from verbal abuse to physical attacks - have been reported to them. Sgt Kathryn Crompton, who leads the neighbourhoods, confidence and equality team at GMP - and worked closely with Sylvia on the policy - said: "The judge in Sophie's murder trial stated that he felt it was a hate crime. "The legacy of that is that forces, not just Greater Manchester, are recognising that people are targeted for being different. "And whatever reason we are different, the message is the same - we should celebrate people's differences not target them." On the 10th anniversary of the attack on Sophie, 15,000 people - including her family - gathered in a field in Derbyshire for the annual Bloodstock Open Air festival. The heavy metal event has been a haven for alternative people since it began in 2005 and the organisers have worked closely with Sophie's family, naming one of its stages after her. "The importance for us is that the awareness is permanent," says Vicky Hungerford, one of the festival's organisers. "It still happens in our community. They face violence in the streets, and we hear about it from our fans. It is something we can never stop campaigning about and we will make sure Sophie is never forgotten."